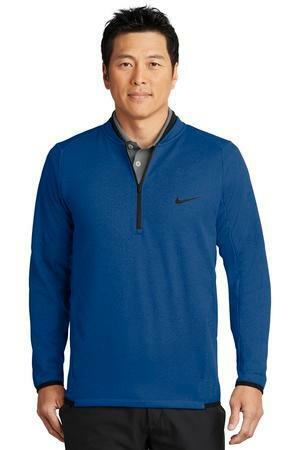 Designed to lock in warmth, this fleece has brushed softness and a 1/2 zip placket for easy on/off. The design features a zip-up blade collar, zippered pockets and contrast mesh binding at the cuffs and hem. A contrast heat transfer Swoosh design trademark is on the left chest. Made of 7-ounce, 100% polyester Therma-FIT fabric.